Since July 2015 they have been studying at the German Sports University in three appearance phases and by self-studying periods, on Friday the first ever 15 European Handball Managers received their certificates after finishing the studies with their written and oral exams at the German Sports University in Cologne. Attended by a group of Members of EU Parliament and EU Commission including former Polish Handball national team coach Bogdan Wenta, EHF President Jean Brihault, EHF Secretary General Michael Wiederer as well as Helmut Höritsch (EHF Competence Network) and Carmen Manchado (EHF Women’s Handball Board) handed over the certificates to the group of managers. “This study guarantees education and sustainability in European handball. The original idea was addressed to us by the clubs and thanks to the great cooperation we finally managed to implement this studies, we are proud on this great cooperation with the German Sports University,” said Jean Brihault. One of those initiators was Gerd Butzeck, director of the Forum Club Handball, who also attended the award ceremony. The EHF is cooperation partner of the German Sports University, which organized the certificate studies for the first time in 2015/2016. Programme Director Dr. Stefan Walzel was highly satisfied with the outcome of the first year of the European Handball Manager Certificate studies. “We can be proud of this certificate studies and the achievement, as handball now is the role model for other European sports. Those new European Handball Managers are the best ambassadors for the programme. All graduates did a great job parallel to their demanding jobs at clubs or federations,” he said. The next edition 2016/17 will be held in English language and the participants for the new studies are already confirmed. Main topics of the programme are strategic management in handball, club and federation law, economic basics and the governance of team sports. Among those first European Handball Managers are current SG Flensburg-Handewitt player and 2014 VELUX EHF Champions League winner Holger Glandorf, 2007 World Champions and 2004 EHF EURO champion Henning Fritz, the Bundesliga club managers Axel Geerken (MT Melsungen, awarded with the certificate of honour as the best graduate of the first course), Benjamin Chatton (TSV Hannover-Burgdorf) or Emmanuelle Bru from the management of EHF Cup Finals host HBC Nantes. Another new female European Handball Manager is Grit Jurack. 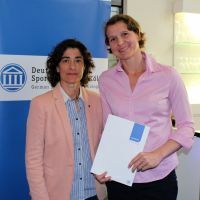 The participation of the three times EHF Champions League winner and German record international was supported by the EHF Women’s Handball Board. “This is a great day for women's handball. Congratulations to Grit for successfully completing the studies,” said Carmen Manchado. “We were never in doubt that Grit would use the given opportunity and support provided by the EHF for the European Handball Manager Certificate Programme, and we feel confident of her leadership skills, and hope that she will have the opportunity to use the knowledge and expertise, and to put her competence into practice very soon,” she added. For next season, four female participants at the European Handball Manager Certificate Programme will be supported by the EHF with the aim to strengthen the competences of women in a key position in handball.